In my earlier post on how I save nearly half of my salary, the topic Micro Needling was mentioned. My apologies to UN for reading his comments this late, requesting for more information on this topic. 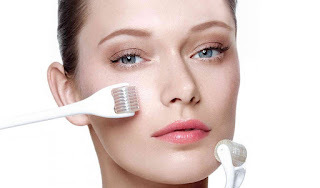 Micro needling or other facial treatments commonly costs us around $100 or more in Singapore facial outlets. Some of us may avoid paying such hefty fees despite hoping to look younger or better. Many are unware that it is a problem that can be solved by themselves. When my dermatologist shared that micro needling is a faster process than most other procedures, it led me to do some further research. I was astounded to find out that we can easily do it ourselves, saving us from facial packages. In fact, it is a growing trend and some celebrities are also having these treatments. The process consists of rolling many teeny-tiny needles over your skin, to encourage collagen/elastin production from beneath. This results in younger, clearer skin and lightening of wrinkles/marks/scars. One must be able to bear some pain and take precautions while performing such invasive process. We can get the needed products within Singapore. XMedicImports used to have an outlet in Bedok but is now limited to its sole outlet in Jurong. Fret not as their products can be mailed to your doorstep. Delivery costs will appear accordingly on their online platform based on the products that you picked. If you need further assistance on which product suits you best, you can contact them via email stated on their site.For faster response, you can drop an instant message at their Carousell account. 1) Cleanse your face and make it dry. 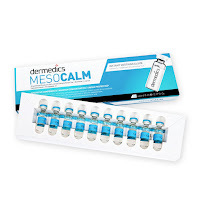 2) Apply Meso Calm on your face to hydrate it. 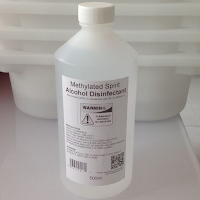 3) Disinfect your Derma Roller with Alcohol Disinfectant. Make sure to dry your Derma roller to rid the alcohol before you start micro needling. 4) There is an effective and correct way of doing derma rolling. The below video shows us the required directions (up and down, and diagonally up and down) and how you should hold the derma roller. It is suggested to roll 20-30 times lightly in each stated direction. Do not use too much force. 6) Disinfect your derma roller with alcohol after use. -Micro Needling is an invasive process and we need to take good care of our skin while performing it. Any severe damages can be long lasting or unpleasant to see. -It is normal for the face to be reddish for minimum of 1 day, depending on how many times and how much force is applied. It is also normal to see a bit of blood. Thus, I will recommend one to perform the procedure on a Friday night and reddishness will be gone by Monday when you go to work. -If you have sensitive skin, please check with your dermatologist if you are suitable for such procedure. -Tip: It will be good to first try micro needling on a small part on your skin or your hand to see its effect. -Let the skin rest 3-4 weeks after each procedure. This will allow the release of collagen to last longer as well as ensure faster recovery. -Do not use facial washes around for 2 weeks after the procedure. If you need to, please read up on the products which are suitable. -Important: Ensure sun screen protection 1-2 weeks after procedure. For more in-depth guide and research, you may visit the given site specializing on beauty and wellness. Please do read up more before performing micro needling and take your own needed precautions. Nobody else will be liable as it is your skin after all!